Have you ever said "I don't want to live on this planet anymore"? Now you can! We at Kerman & Kerman Orbit and Surface Structures are proud to present you the all new product line for Kerbals who want nothing more than to live on another planet! 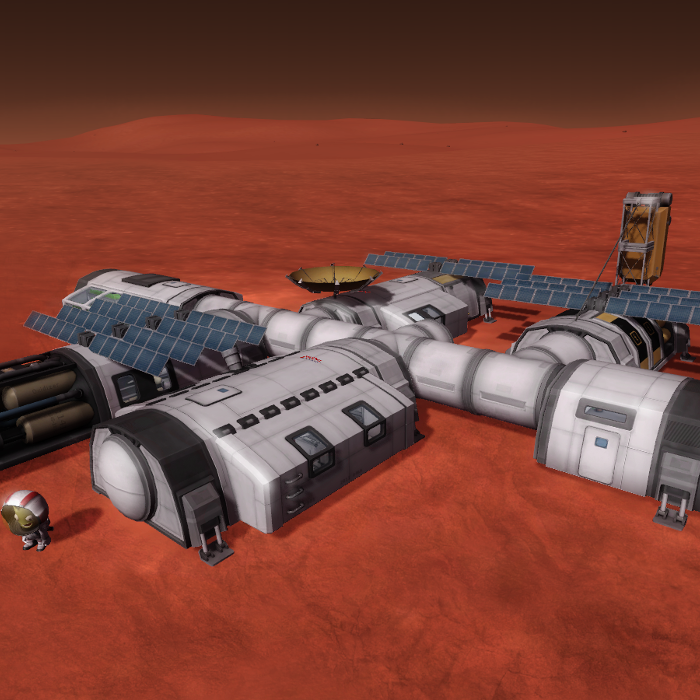 This mod adds several new parts that are designed to be used in a planetery base for the Kerbals. This includes Habitats, Greenhouse, Laboratory, a Cupola derivative, Command-Center and others. It is designed to fit with the other stock parts and feel als "Kerbal" as possible. Please use the Forum Thread for questions or to report any bugs! 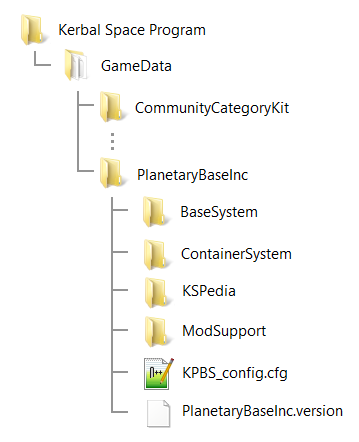 In this folder (Kerbal_Planetary_Base_Systems-X.X.X) you find a folder named "GameData"
Copy the content of this GameData folder (namely the folder CommunityCategoryKit, CommunityResourcePack and PlanetaryBaseInc) into the GameData folder from your Kerbal Space Program installation. You can easily indentify you KSP installation directory, it contains the executable (e.g. KSP.exe for Windows). If you already have these folders in your GameData diretory, remove them folder first. Do not overwrite, this can cause errors and duplicate or bugged parts. You need ModuleManager to use the supported mods! If anyone is interested to translate KPBS into Japanese French , Italian (in process) or Brazilian Portuguese , please let me know! The Laboratory in the Central Hub now works with 40% speed not less than 1% of the stock Lab. Added missing Keepfit configs to parts (Freezer and Garage adapter). This time for real. Added probe control points to Control, Central Hub and HAL. Adjusted attachment points for the legs on the garage to avoid blocking. Readded the missing plugin dll. Added the first KSPedia entries (still more to come). The Attachable Landing Gear is much more robust and better handable now. Some rebalancing of the TechTree. Added support for ScanSAT (Thanks to Dr. Jet). Cry-5000 was updated to support latest JSIAdvTransparendPods features (Thanks to JPLRepo). Fixed lights going off on expandable parts when loading (again). (Thanks to Svizel). Fixed visual appearance of the drills. Excess Fertilizer is not dumped anymore, this closes a hole in the lifecycle for USI-LS (Thanks to Svizel). Added missing "Transfer Crew" option on deployable parts. The deploy animation of the underside landing leg now works properly again. The syspension of the attachable landing leg now works again. Rewritten IVA logic for the expandable parts. This should prevent kerbals from dissapearing and game crashes when loading a vessel. Fixed support for the RPM Transparent Pod feature. Updated support for RPM (new transparent pod feature). Thanks to JPLRepo. The visual glitch for the Bi-Cupler when obscured by a transparent part in the editor does not appear in 1.1 anymore. Removed duplicate flag and added a new one. Added Exception Checks for the Editor Categories. Other mods should be visible again when an error happens. Added container version of the science-jr.
Added support for DeepFreeze (Cryopods and Container). Thanks to JPLRepo and MerlinsMaster for them! The small inline modular storage is now also labeled as "inline"
Changed capacity of the KIS container to be more realistic. Added a KIS Container for the storage. Several Typos and errors in the descriptions removed. Thanks to Wolf Baginski for pointing them out! Scaled and mirrored some flags on the parts to be correct. The doors are scaled up and repositioned. Hotfix for the wrong filepaths. The models are now available in SPH and VAB. This issue was caused by the KSP update to 1.4.0. which made expecially this wheel very awkward. The latest update to 1.6.0 (released some minutes ago) should solve that issue. Help i cant really install it i mean i can but there are no Base parts or anything that i can build with. Have you read the installation instructions written in the description of this mod? This error is due to installing it in the wrong place. I had a good idea for you! If you can, Make Separators,Decouplers and Docking Ports in the Planetary Base form, to dock in space and make more easy for make base. Hello, I'm french and if you want I can translate it in french. It's an awesome mod, congratulations ! I translated the KSPedia in french, I suggested the file on GitHub. I have not seen anything on github yet. Have you made a pull request? Hello. I have a problem with the mod, I installed it like it should be (put the game data folder of the mod inside the Game data folder of KSP) and the guide for even shows up in KSPedia but I cant find any parts in the ship editor. Turning the KBPS config things on or off didnt help either. Actually you have to put the content of the GameData folder provided by this mod into the GameData folder of KSP. Not the GameData folder itself. I have downloaded and installed the latest version of the Planetary Base System mod. What can I do to fix the issue? Those parts were deprecated and replaced way back with version 0.2.9 of this mod in December 2015 and finally removed half a year ago to reduce clutter. You can still download them from here to get your old bases running: Deprecated parts. Just copy the "PlanteryBaseInc" folder in the zip-file into your GameData folder. I would recomment to replace the parts (e.g. via KIS) with the new ones. The deprecated parts are no longer updated (e.g. they will not be localized) and i cannot guarantee that they will work with future versions of KSP. Hi, I have the latest version of KSP installed and tried to follow the instructions for your mod, but... doing everything as shown in the "guides" for installing the mod has not worked. I have the directory set up as per your instructions and added in the MM, but the game does not load past the "Kkaoss drill" file. I have tried everything I could think of, but the load still fails. This problem is most likely due to incompatible version of KSP and this and/or other mods. Please make sure that KPSB and any other mod (especially ModuleManager) are explicdly supportting the exact version of KSP you are running. E.g. when you have KSP 1.3.0, you need KPBS version 1.4.3, the lastest version of KPBS for KSP 1.2.2,1.2.1 and 1.2.0 is version 1.4.2. If you are 100% sure that all yor mods are compatible with your version of KSP and it still does not work, please send me the log file KPS creates every time it runs. (It is the file name KSP.log that is located in the same directory as the KSP executable). You can e.g. upload the Log to a filehoster and send me the link to it. How do you download this. I put it in the game data file and it didn't work. Can someone plz help me? Did you take a look at the installation instructions that are mentioned in the description above? Sorry, but that is not possible. I didn't even have KSP back when 0.23.5 was released.